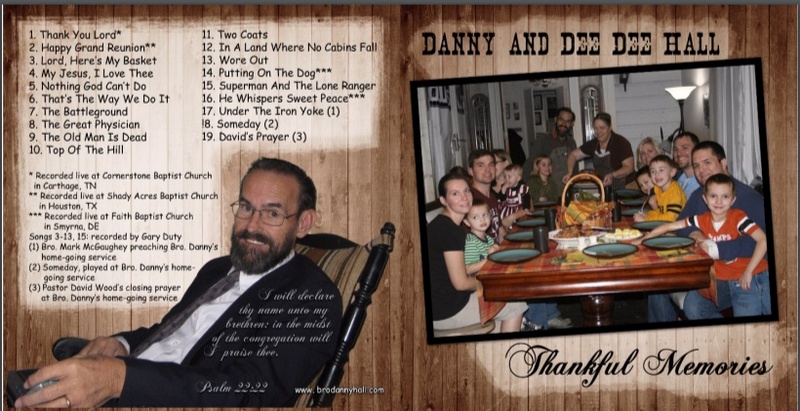 I’m excited to share with you all a “new” Danny & Dee Dee Hall CD. Mom has been dreaming of this project for a while, and thanks to several friends’ hard work and contributions (many many thanks to the Seminole String Band), it finally became a reality this year. This CD has 19 tracks. It has four songs recorded live (which are my favorite because you can really hear dad’s heart when he was ministering to the church), two audio clips from Dad’s home going service, and 13 more of their most requested songs that were recorded back in the early 2000’s. Mom and I were going back and forth on what to call this CD. We also were digging through pictures and doing our best to find the perfect one for this compilation of old and new. We finally decided on our last family picture that we all took together. It was Thanksgiving of 2011. Mom wanted to recreate aNorman Rockwell Thanksgiving photo, so there we all are, goofy grins in place, gathered around the feast at the table in our new dining room that dad worked so hard to finish for us all. We were about to hear dad give thanks one more time for his family and friends and all the blessings from the Lord that year. If there was anything dad was good at, it was giving thanks. Finally we had found our picture. After mom and I decided on the picture, we agreed the only suitable title would be “Thankful Memories.” We are so thankful for all the special memories that we have of our family together, but most of all, of those memories were dad was thankful, where his life, his ministry and his music gave praise and glory to the Lord Jesus Christ. The new CD is a blessing! Cried like a baby but it was a good cry. Bro. Danny taught me about real men and tears. If you don’t have something that takes you to tears I would take inventory of your life. Thankful memories of my buddy. I love you Carrie. Uncle Mark! Carrie, please say hello to your Mother for me! I’m in tears Carrie, I almost lost it just reading what songs were listed. I will be ordering my CD soon. Thank you so much for the email. I hope to hear how you all are doing. I especially would like to hear how that baby boy is doing. You all are in my prayers. Well, it has been a while since I got on here, but will never forget my buddy. This years (2017) Beggars meeting really hit home for me as I looked and DeeDee and Danny were not here!